Trademarks. All trademarks, service marks and trade names of HZRT or HZRT’s licensors used herein (including but not limited to: the Howard Zinn name, the Howard Zinn signature, the Web Site name, design and any logos) (collectively “Marks”) are trademarks or registered trademarks of HZRT or its affiliates, partners, vendors or licensors. You may not use, copy, reproduce, republish, upload, post, transmit, distribute, or modify HZRT trademarks in any way, including in advertising or publicity pertaining to distribution of materials on the Web Site, without HZRT’s prior written consent. The use of HZRT trademarks on any other web site or network computer environment is not allowed. HZRT prohibits the use of HZRT trademarks as a “hot” link on or to any other web site unless establishment of such a link is approved in advance. Submissions Policy. HZRT does not accept or consider creative ideas, suggestions, or materials other than those it has specifically requested. This policy is designed to avoid misunderstandings if projects developed by HZRT’s professional staff seem to others to be similar to their own creative work. Accordingly, HZRT requests that your comments relate to those services and products offered by HZRT, and that you not submit any creative ideas, suggestions, or materials except where specifically requested or solicited. If you do send us an unsolicited submission, you agree not to assert any ownership right of any kind in the unsolicited submission against HZRT (including, but not limited to copyright, trademark, unfair competition, moral rights, or implied contract), you hereby grant HZRT a nonexclusive, perpetual, worldwide license to the unsolicited submission in every media and for every purpose now known or hereinafter discovered and you waive the right to receive any financial or other consideration in connection with such unsolicited submission including, but not limited to, credit. You release HZRT (and our officers, directors, agents, subsidiaries, joint ventures and employees) from claims, demands and damages (actual and consequential) of every kind and nature, known and unknown, suspected and unsuspected, disclosed and undisclosed, arising out of or in any way connected with your unsolicited submissions, including without limitation all claims for theft of ideas or copyright infringement. Accuracy of Information. We attempt to ensure that information on this Web Site is complete, accurate and current. Despite our efforts, the information on this Web Site may occasionally be inaccurate, incomplete or out of date. We make no representation as to the completeness, accuracy or currency of any information on this Web Site. Frames. Running or displaying this Web Site or any information or material displayed on this Web Site in frames or through similar means on another web site without our prior written permission is prohibited. Any links to this Web Site must comply will all applicable laws, rule and regulations. Third Party Links. From time to time, this Web Site may contain links to web sites that are not owned, operated or controlled by HZRT or its affiliates. All such links are provided solely as a convenience to you. If you use these links, you will leave this Web Site. Neither we nor any of our respective affiliates are responsible for any content, materials or other information located on or accessible from any other web site. Neither we nor any of our respective affiliates endorse, guarantee, or make any representations or warranties regarding any other web sites, or any content, materials or other information located or accessible from any other web sites, or the results that you may obtain from using any other web sites. If you decide to access any other web sites linked to or from this Web Site, you do so entirely at your own risk. Security. In consideration of your use of the Web Site, and to the extent you provide any information about yourself and/or your business, such information will be true, accurate, current and complete. If you provide any information that is untrue, inaccurate, not current or incomplete, or if HZRT has reasonable grounds to suspect that such information is untrue, inaccurate, not current or incomplete, HZRT has the right to refuse any and all current or future use of the Web Site (or any portion thereof). You are responsible for taking precautions and providing security measures best suited for your situation and intended use of the Web Site. Fees. You are responsible for purchase of, and payment of charges for, all Internet access services and telecommunications services needed for use of this Web Site. Access and Interference. You agree that you will not use any robot, spider, scraper or other automated means to access the Web Site for any purpose without our express written permission. Additionally, you agree that you will not: (i) take any action that imposes, or may impose in our sole discretion an unreasonable or disproportionately large load on our infrastructure; (ii) interfere or attempt to interfere with the proper working of the site or any activities conducted on the Web Site; or (iii) bypass any measures we may use to prevent or restrict access to the Web Site. Force Majeure. Neither HZRT nor you shall be responsible for damages or for delays or failures in performance resulting from acts or occurrences beyond their reasonable control, including, without limitation: fire, lightning, explosion, power surge or failure, water, acts of God, war, revolution, civil commotion or acts of civil or military authorities or public enemies: any law, order, regulation, ordinance, or requirement of any government or legal body or any representative of any such government or legal body; or labor unrest, including without limitation, strikes, slowdowns, picketing, or boycotts; inability to secure raw materials, transportation facilities, fuel or energy shortages, or acts or omissions of other common carriers. DISCLAIMERS Your use of this WEB Site is at your risk. THE INFORMATION, MATERIALS AND SERVICES PROVIDED ON OR THROUGH THIS WEB SITE ARE PROVIDED “AS IS” WITHOUT ANY WARRANTIES OF ANY KIND INCLUDING WARRANTIES OF MERCHANTABILITY, FITNESS FOR A PARTICULAR PURPOSE, OR NON-INFRINGEMENT OF INTELLECTUAL PROPERTY. NEITHER HZRT, NOR ANY OF ITS AFFILIATES WARRANT THE ACCURACY OR COMPLETENESS OF THE INFORMATION, MATERIALS OR SERVICES PROVIDED ON OR THROUGH THIS WEB SITE. THE INFORMATION, MATERIALS AND SERVICES PROVIDED ON OR THROUGH THIS WEB SITE MAY BE OUT OF DATE, AND NEITHER HZRT, NOR ANY OF ITS AFFILIATES MAKES ANY COMMITMENT OR ASSUMES ANY DUTY TO UPDATE SUCH INFORMATION, MATERIALS OR SERVICES. THE FOREGOING EXCLUSIONS OF IMPLIED WARRANTIES DO NOT APPLY TO THE EXTENT PROHIBITED BY LAW. PLEASE REFER TO YOUR LOCAL LAWS FOR ANY SUCH PROHIBITIONS. NO ADVICE OR INFORMATION, WHETHER ORAL OR WRITTEN, OBTAINED FROM HZRT OR THROUGH THE HZRT WEB SITE, PRODUCTS AND/OR SERVICES WILL CREATE ANY WARRANTY NOT EXPRESSLY MADE HEREIN. LIMITATIONS OF LIABILITY. HZRT does not assume any responsibility, nor will be liable, for any damages to, or any viruses that may infect your computer, telecommunication equipment, or other property caused by or arising from your access to, use of, or browsing this Web Site, or your downloading of any information or materials from this Web Site. IN NO EVENT WILL HZRT, OR ANY OF ITS OFFICERS, DIRECTORS, EMPLOYEES, SHAREHOLDERS, AFFILIATES, AGENTS, SUCCESSORS OR ASSIGNS, NOR ANY PARTY INVOLVED IN THE CREATION, PRODUCTION OR TRANSMISSION OF THIS WEB SITE, BE LIABLE TO YOU OR ANYONE ELSE FOR ANY INDIRECT, SPECIAL, PUNITIVE, INCIDENTAL OR CONSEQUENTIAL DAMAGES (INCLUDING, WITHOUT LIMITATION, THOSE RESULTING FROM LOST PROFITS, LOST DATA OR BUSINESS INTERRUPTION) ARISING OUT OF THE USE, INABILITY TO USE, OR THE RESULTS OF USE OF THIS WEB SITE, ANY WEB SITES LINKED TO THIS WEB SITE, OR THE MATERIALS, INFORMATION OR SERVICES CONTAINED ON ANY OR ALL SUCH WEB SITES, WHETHER BASED ON WARRANTY, CONTRACT, TORT OR ANY OTHER LEGAL THEORY AND WHETHER OR NOT ADVISED OF THE POSSIBILITY OF SUCH DAMAGES. THE FOREGOING LIMITATIONS OF LIABILITY DO NOT APPLY TO THE EXTENT PROHIBITED BY LAW. PLEASE REFER TO YOUR LOCAL LAWS FOR ANY SUCH PROHIBITIONS. IN THE EVENT OF ANY PROBLEM WITH THIS WEB SITE OR ANY CONTENT, YOU AGREE THAT YOUR SOLE REMEDY IS TO CEASE USING THIS WEB SITE. IN NO EVENT SHALL HZRT ‘S TOTAL LIABILITY TO YOU FOR ALL DAMAGES, LOSSES, AND CAUSES OF ACTION WHETHER IN CONTRACT, TORT (INCLUDING, BUT NOT LIMITED TO, NEGLIGENCE), OR OTHERWISE EXCEED THE GREATER OF TWENTY FIVE DOLLARS (US $25.00). Indemnity. You agree to defend, indemnify and hold HZRT and any affiliated company or individual harmless from any and all liabilities, costs, and expenses, including reasonable attorneys’ fees, related to or in connection with (i) the use of the Web Site or the Internet or your placement or transmission of any message or information on this Web Site by you or your authorized users; (ii) your violation of any term of this Agreement, including without limitation, your breach of any of the representations and warranties above; (iii) your violation of any third party right, including without limitation any right of privacy, publicity rights or Intellectual Property Rights; (iv) your violation of any law, rule or regulation of the United States or any other country; or (v) any other party’s access and use of the Web Site with your unique username, password or other appropriate security code. Release. In the event that you have a dispute with one or more other users of the Web Site, you release HZRT (and our officers, directors, agents, subsidiaries, joint ventures and employees) from claims, demands and damages (actual and consequential) of every kind and nature, known and unknown, suspected and unsuspected, disclosed and undisclosed, arising out of or in any way connected with such disputes. DIGITAL MILLENNIUM COPYRIGHT ACT (“DMCA”) NOTICE. In operating the Web Site, we may act as a “services provider” (as defined by DMCA) and offer services as online provider of materials and links to third party web sites. As a result, third party materials that we do not own or control may be transmitted, stored, accessed or otherwise made available using the Web Site. HZRT has in place certain legally mandated procedures regarding allegations of copyright infringement occurring on the Website. HZRT has adopted a policy that provides for the immediate removal of any content or the suspension of any user that is found to have infringed on the rights of HZRT or of a third party, or that has otherwise violated any intellectual property laws or regulations, or any of the terms and conditions of this Agreement. If you believe any material available via the Web Site infringes a copyright, you should notify us using the notice procedure for claimed infringement under the DMCA (17 U.S.C. Sect. 512(c)(2)). We will respond expeditiously to remove or disable access to the material claimed to be infringing and will follow the procedures specified in the DMCA to resolve the claim between the notifying party and the alleged infringer who provided the Content. Additional Assistance. 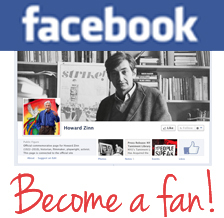 If you do not understand any of the foregoing Terms and Conditions or if you have any questions or comments, we invite you to contact us by email: admin [at] howardzinn [dot] org. Copyright Notice. All Site design, graphics, text selections, arrangements, and all software are Copyright © 2015 Howard Zinn Revocable Trust. ALL RIGHTS RESERVED.